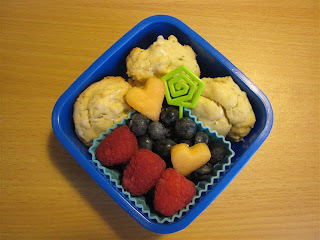 BentoLunch.net - What's for lunch at our house: Preschool Snack Bento #3! Back to a more snack-like bento instead of a bento lunch today. We're going to eat lunch before preschool, so Ben can have an afternoon snack, then an earlier dinner before church tonight. Preheat the oven to 375°F. Coat cookie sheets with nonstick cooking spray. In a medium bowl, cream together the butter and sugar until light and fluffy. Beat in the egg, lemon juice, and lemon peel. Stir in the flour, baking powder, and salt just until the dry ingredients are mixed in, stir in the zucchini. Drop by rounded teaspoonfuls 2 inches apart onto the cookie sheets. Bake for 15 to 20 minutes, until cookies are golden around the edges. Combine 1/2 cup confectioners' sugar with 2 teaspoons fresh lemon juice. Drizzle the glaze over the cooled cookies. Great idea! Will try it soon! Ooh sounds awesome! Welcome to the foodie blogroll! Just made these with a cup of blueberries instead of zucchini and they are sooo yummy.